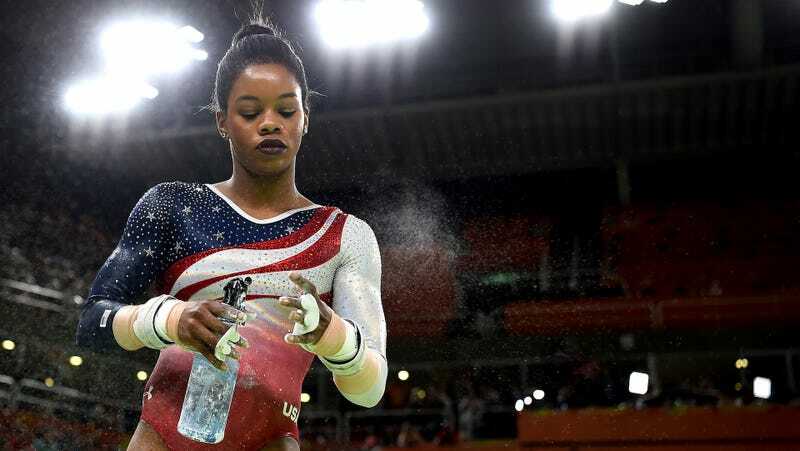 Last week, Olympic gymnast Gabby Douglas responded to teammate Aly Raisman’s announcement that she’d been abused by former team doctor Larry Nassar by saying “it is our responsibility as women to dress modestly and be classy. dressing in a provocative/sexual way entices the wrong crowd.” Douglas quickly apologized, and today she released a lengthy statement of her own, apologizing once again, claiming that she did not intend to victim-shame Raisman, and seeming to say that she was also abused by Nassar herself. “It would be like saying that because of the leotards we wore, it was our fault that we were abused by Larry Nassar,” Douglas wrote. Nassar has been accused of abusing over 140 women and girls during his years as the team doctor for the U.S. women’s gymnastics team; high-profile gymnasts like McKayla Maroney and Raisman have recently announced that they were among the women he victimized. Raisman recently said that many victims are afraid to speak up because of pressure from USA Gymnastics and a broader culture of abuse. Nassar will is expected to plead guilty in two criminal cases against him. Update (7:44 p.m.): USA Today has confirmed that Gabby Douglas says she was abused by Nassar; the headline has been changed to reflect this.